These Air Force Falcons Don't Play Football - They Save Lives - Strike Fighter Consulting Inc.
There’s one aerial foe that has been plaguing the USAF for centuries, something more nefarious than missiles, flak guns, and other ground-to-air weapons. Birds. Yep, birds. Our feathery friends casually fly overhead without a care in the world, but they can spell serious trouble for pilots and their multi-million-dollar aircraft. Many Americans are already well aware of the fact that US Airways Flight 1549 went into the Hudson River because of a close encounter with the bird kind. You think that’s bad? That collision was just in the first few minutes of flight. Imagine what a flock of birds would do to an engine in a 500 mph collision. 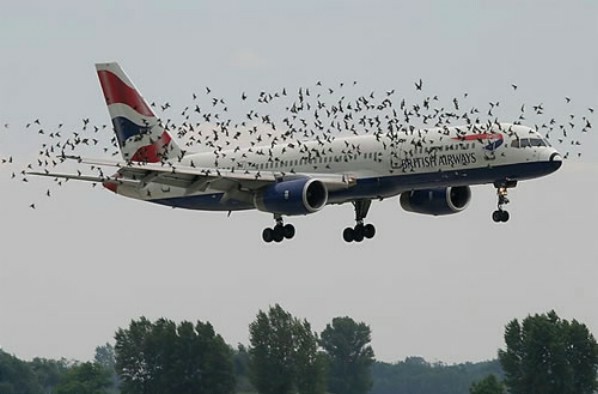 Just to put this bird problem into perspective, there were 4,471 documented aircraft-bird strikes in 2011 alone, amounting to $13 million bucks in damages. Maj. Jeremy Fischman, a flight safety chief at McConnell Air Force Base, explained, “One strike, if the bird hits the wrong spot on a plane, could do $50 to $100,000 worth of damage.” Keep in mind that a chunk of that repair bill comes out of your pay check, my friend. 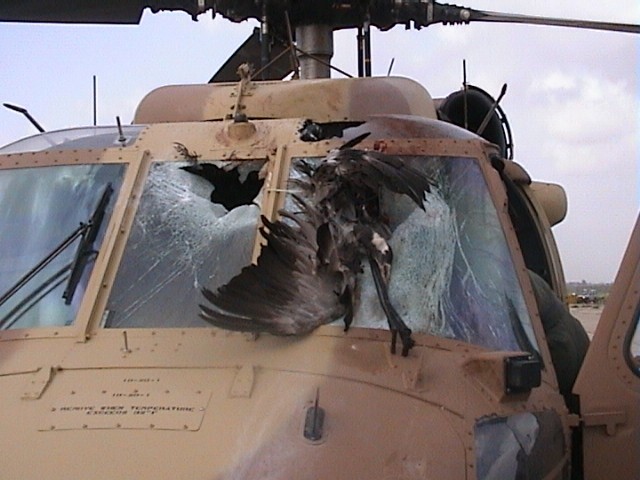 The US Air Force is prepared to fight fire with fire – that is, fight birds with birds. 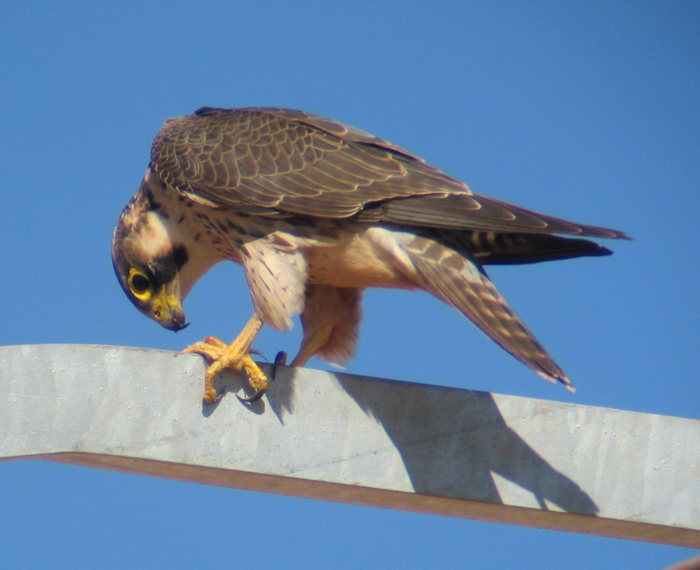 Sidewinder missiles and GAU-12 Equalizer 25 mm cannons may not be enough to keep pigeons and geese off of US airports, but Elaina, a Barbary falcon, and Jack, a Peregrine-Prairie hybrid, might do the trick. These Air Force falcons might seem a little bit low-tech for the Air Force. After all, it wouldn’t be out of character for them to develop a several-million-dollar bird missile. This strategy has the advantage of being fairly cheap, easy to maintain, and humane. Introducing more predators to the environment might seem cruel, but it’s a lot better than destroying bird nests or shooting them out of the sky – techniques that have both been tried at other airports. In fact, Germany made headlines with the same stunt back in 2010 when they used a falcon to scare off crows that kept striking their fleet of F-16 Fighting Falcons. It’s a bit poetic, isn’t it? Falcons protecting falcons. It has a similar profound meaning here in the States where the Air Force Falcons represent the USAF on the football field. Now, if only we could train bald eagles to do the same thing. 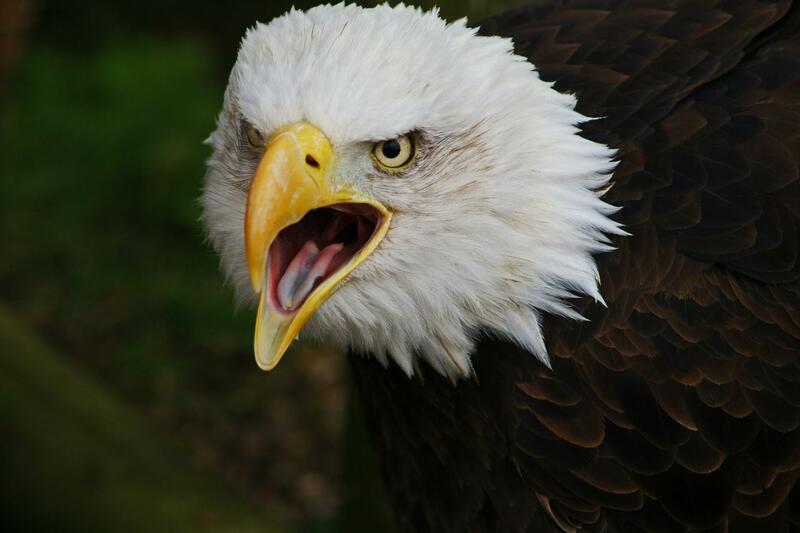 Bald eagles at every major US air base — that would truly be a sight, wouldn’t it?